Section 10 of Alameda County Waste Management Authority (ACWMA) Mandatory Recycling Ordinance (ACWMA Ordinance 2012-01) allows property owners to request waivers from certain requirements of the ordinance if certain conditions are met. To request a waiver, please complete the waiver application and submit to ACWMA as instructed. The Enforcement Official may waive some or all of the requirements of Sections 4 or 5, as appropriate, if documentation satisfactory to the Enforcement Official is provided that physical space limitations prevent full compliance with these Sections. A Waste Generator or Property Owner seeking this waiver must provide documentation from service providers, licensed architects or engineers, or building officials from a Covered Jurisdiction that demonstrates that the Waste Generator or Property Owner does not have adequate space for containers for Covered Material and cannot obtain collection services that direct Solid Waste to High Diversion Mixed Waste Processing Facilities. The Enforcement Official may waive some or all of the requirements of Sections 4 or 5, as appropriate, at a collection location if documentation satisfactory to the Enforcement Official is provided that Covered Materials comprise, on an on-going and typical basis, less than 10% by weight of Solid Waste taken to landfill(s) from that collection location. In some Covered Alameda County cities or Sanitary Districts, a blanket waiver for commercial organics will be in effect as of July 1, 2014, for business types that are presumed to generate a de minimus amount of food and compostable paper. The blanket waiver would waive the requirement that those businesses have separate organics recycling collection service. 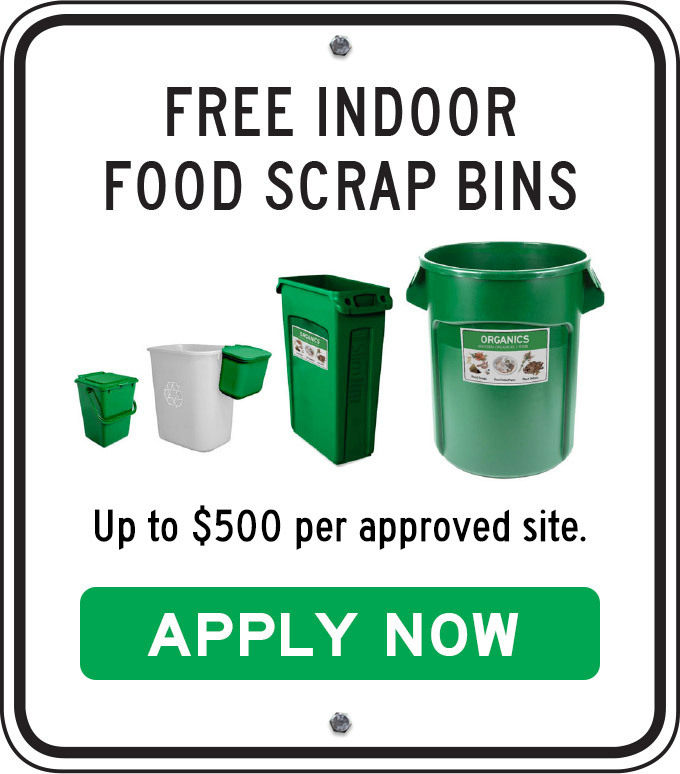 If during a routine inspection of the garbage container reveals that a larger than de minimus amount of food and/or compostable paper is being discarded the property owner or business will be notified that they are no longer covered under the waiver and will be required to obtain organics recycling collection services. The Enforcement Official may waive some or all of the requirements of Sections 4 or 5, as appropriate, if documentation satisfactory to the Enforcement Official is provided that compliance with the Ordinance would create a financial hardship for a Property Owner. Hardship exists when implementation of this Ordinance will increase Solid Waste collection service bills for a particular collection location by more than 30% per typical billing period as compared with the cost of Solid Waste collection services in the absence of this Ordinance and State laws requiring recycling services at Businesses and Multi-Family Buildings. Hardship also exists when the sum of the change in billing described in the previous sentence plus the amortized costs of Solid Waste enclosures or other physical modifications necessary to house additional containers collected by truck, if such construction is required by Federal, State, or Local laws or regulations, exceeds 30% of the cost of Solid Waste collection services in the absence of this Ordinance and State laws requiring recycling services at Businesses and Multi-Family Buildings. Eligible construction costs shall be amortized over an appropriate period for such costs based on Internal Revenue Service or alternative authoritative guidance or standards. The financial hardship calculation shall take into consideration the cost savings potential of decreasing Refuse or Solid Waste service levels, and opportunities to reduce Solid Waste bills through changes in service providers, when that is legal within the relevant Covered Jurisdiction(s). The Enforcement Official may require compliance with some, but not all, requirements of this Ordinance if necessary to limit the increase in eligible costs to less than 30%. Any Waste Generator or Property Owner (or Covered Jurisdiction on behalf of Waste Generators or Property Owners in its service area) may seek a waiver from the Enforcement Official by presenting evidence that more time is needed to fully implement a compliant program, and by providing a complete written proposal stating when full compliance will be achieved. If a compliance schedule waiver is granted, the Waste Generator or Property Owner or Covered Jurisdiction shall demonstrate on an on-going basis its good faith efforts to comply by the compliance date(s) stated in the approved waiver. Certain Covered Jurisdictions have applied for and received approval for compliance schedule waivers on behalf of Waste Generators in their service area for some or all of the requirements for Phase 2 of the Ordinance. These are reflected in the Rules by City pages. The Enforcement Official may waive some or all of the requirements of Sections 4 or 5, as appropriate, if documentation satisfactory to the Enforcement Official is provided that neither separate collection for Covered Materials nor the service of a High Diversion Mixed Waste Processing Facility is available. If the Enforcement Official determines that any type of Covered Material cannot feasibly be Recycled for a limited time period due to emergency conditions, then the Enforcement Official may permit that component of Covered Materials to be Deposited in landfill(s) for that limited time period.